This book provides readers the idea of systemically synthesizing various kind of knowledge, which needs to combine analytical thinking and synthetic thinking. Systems science is expected to help in solving contemporary complex problems, utilizing interdisciplinary knowledge effectively and combining analytical thinking and synthetic thinking efficiently. However, traditional systems science has been divided into two schools: one seeks a systematic procedure to give a correct objective answer; the other develops an emergent, systemic process so that the user can continue exploratory learning. It is not an exaggeration to say that analytical thinking and synthetic thinking have been developed independently, in different schools. This book integrates approaches developed in these two schools, using ideas in knowledge science that have been emerging recently under the influence of Eastern thinking. It emphasizes the importance of utilizing intuition in systems approaches, whereas other books usually try to solve problems rationally and objectively, rejecting subjectivity. This book never denies rationality and objectivity; however, complex problems of today do not always yield to complete analysis. The novelty of this present volume is that it takes in the ideas of synthetic thinking in knowledge science to develop systems science further. 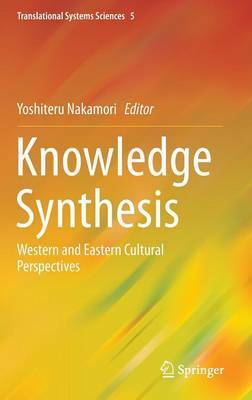 The chapter contributors, who are experienced systems scientists with a profound understanding of knowledge management, discuss knowledge synthesis from the Western and Eastern cultural perspectives. The book introduces a theory on systemic knowledge synthesis in an odd chapter and then presents an application of the theory in the next chapter in order to contribute to developing translational systems science.